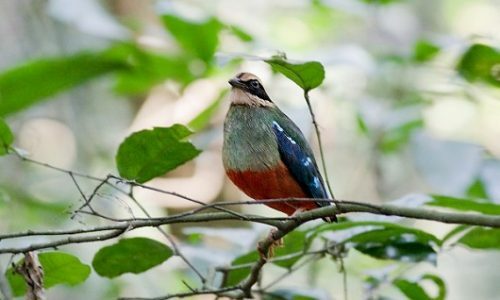 The Kahuzi-Biega National Park is perfectly located in eastern part of Democratic Republic of the Congo along the western bank of Lake Kivu and the Rwandan frontier. The famous park was established in 1970 and declared a UNESCO World Heritage Site, in 1980 due to its unique biodiversity of rainforest habitat and its endangered species of eastern lowland gorillas. 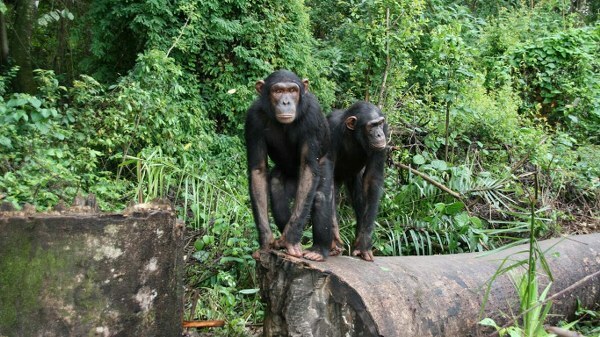 Lwiro Sanctuary; Lwiro Primate Rehabilitation Centre (CPRL) was established/ found in the year 2002 to offer care and rehabilitation for orphaned primate’s species, while working to ensure their existence in the wild. The Sanctuary is situated on the grounds of CRSN, the Congolese Government Scientific Research Centre, which is centered in an old Belgian colonial building. 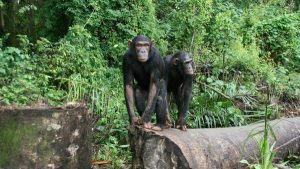 The sanctuary works together with ICCN to offer protection and conservation to the forty nine (49) chimpanzees and over 60 monkeys. Other interesting activities offered in this site include education programs for local people, children, military and tourists. The old Belgian research Centre located on the grounds also has some fascinating exhibits. Idjwi Island; It is one of the unique but less visited Island in DR Congo. The Island is 340 sq km in size and 70 km in length, the second largest inland island in Africa. Located within Lake Kivu it can be seen clearly from both the Rwandan and Congolese main lands. Activities in the Island include visiting one of the many pineapple plantations (and of course picking and eating one), village and nature walks, bird-watching, swimming in the lake as well as interacting with the local people to learn about their life on Idjwi. Boat rides can also be organized to take you around the small islets surrounding the island, where you can also visit nearby fishing villages. Pay the fishermen a small tip to guide you through the lush, primary tropical forest on this little piece of paradise, abounding in bird life and also home to a troupe of as yet unidentified monkeys. 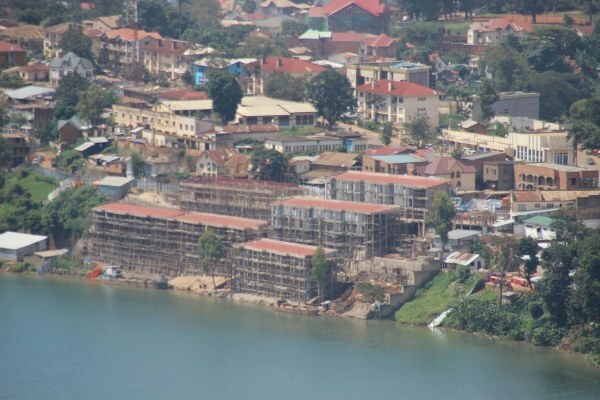 Bukavu City; Bukavu was established in 1901 by the Belgian colonial authorities and is the capital of South Kivu province. This charming city consisting of an estimated 250,000 people boasts of delightful subtropical climate and a scenic location between the southern shores of Lake Kivu and the forested mountains inland. The influences of Belgian colonial times can be found in the grand houses bordering the lake, the old cathedral called Our Lady of Peace and in the magnificent College Alfajiri. This reputed academic institution’s establishment in 1937 heralded the beginning of mixed-race education in the Belgian Congo and yet its history is far from harmonious, being intricately tied in with the tumultuous history of eastern Congo itself. Its grounds were used as a base for a Belgian uprising against Mobutu in the 60s and as refugee camp following the 1994 genocide in Rwanda, and its walls are riddled with the bullet-holes from the subsequent invasion of Rwandan forces. Bird life in Kahuzi-Biega National Park; A rich natural habitat in the park supports the survival of different bird species. The park has total of 349 bird species of which 42 bird species found in the park are endemic to the Albertine Rift, including the Rockefeller’s sunbird, Grauer’s broadbill, Ruwenzori Turaco, Grauer’s warbler and Shelley’s crimsonwing. Birds play an important role in dispersing seeds throughout the park. Some species digest and excrete the seed, allowing seedlings to be spread far from the parent tree. Visit to Lwiro; A forgotten jewel of our region. It’s located about 90 minutes’ drive north of Bukavu town. This was once a favorite retreat of Belgian colonizers and even Mobutu. Aside from a magnificent landscape and being the entry point for the Tshibati waterfall walk, Lwiro hosts fascinating scientific research centers which have opened their doors for tourists. While at the Centre de Rehabilitation des Primates de Lwiro (CRPL), one can find the Centre de Recherches en Sciences Naturelles (CRSN), a research center built by the Belgians in the 1950s, and the Centre Intégral d’Education de Lwiro (CIEL), which aims to educate visitors and local communities about the natural and anthropological history of the region. Visitors will be guided through the biodiversity hall, which includes the skeleton of Casimir, the first ever habituated gorilla, a botanical garden, an anthropological Centre, the CRSN’s herpetology lab and the magnificent library. 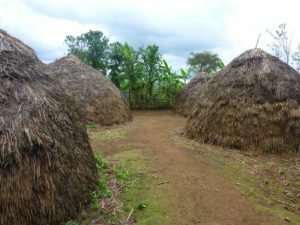 Cultural visit to the Royal Court of the Kingdom of Kabare; The Royal Court of the Kabare Kingdom is located just a forty (40) minute drive from Bukavu town, in the direction of the park, you can now for the first time visit the Royal Court of the Kingdom of Kabare. The Royal Kingdom of Kabare has a long and proud tradition as the most powerful kingdom of South Kivu and the erstwhile Mwami Kabare Rugemanizi “Zéro Zéro” was instrumental in the region’s resistance against colonization and famously slapped a Belgian colonizer in the face. As punishment he was exiled 2,000km away, but brought back 20 years later when the Belgians finally realized that nothing could be achieved without his presence. To this day, the Royal Court retains its traditions and secrets, and visitors can spend time with the Mwami’s wise men who will present some of the objects of symbolic importance to the court, and to listen to the Griot sing the history of Kabare. Visits will finish with an enthusiastic Ntole dance performed by the Bushi villagers. Bukavu City tour; Bukavu was established in 1901 by the Belgian colonial authorities and is the capital of South Kivu province. 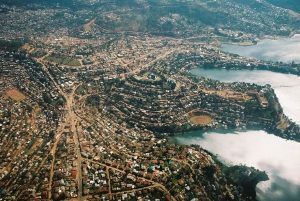 This picturesque city of about 250,000 boasts a pleasant subtropical climate and a scenic location between the southern shores of Lake Kivu and the forested mountains inland. The influences of Belgian colonial times can be found in the grand houses bordering the lake, the old cathedral Our Lady of Peace and in the magnificent College Alfajiri. This reputed academic institution’s establishment in 1937 heralded the beginning of mixed-race education in the Belgian Congo and yet its history is far from harmonious, being intricately tied in with the tumultuous history of eastern Congo itself. Its grounds were used as a base for a Belgian uprising against Mobutu in the 60s and as refugee camp following the 1994 genocide in Rwanda, and its walls are riddled with the bullet-holes from the subsequent invasion of Rwandan forces. The College Alfajiri thus serves as an important reminder of the past whilst at the same time, through its excellent academic programme, holding a key to the region’s future. Lowland Gorilla Trekking; Trekking the Eastern Lowland Gorillas at their natural environment at Kahuzi Biega is a truly unforgettable experience. Just before the entrance to the park is the Tshivanga Visitor Centre where gorilla trekking activities start from. The center has hospital staff who welcome visitors and assist them with payment and registration. Make sure you take a photo with the large gorilla statue while waiting for trackers locate the gorilla family. Once the location is confirmed you will begin to drive into the park. In the park headquarters, you will be briefed and given a detailed introduction covering the history, geography and some facts about the gorilla family you will be visiting. 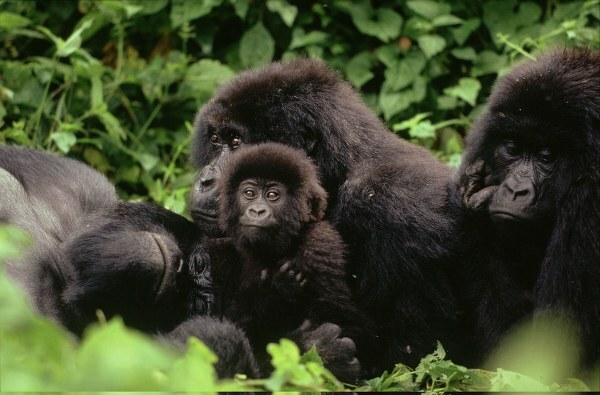 The guide will also provide you with advice on how to behave when with the gorillas. Following the briefing you begin your journey along narrow jungle paths to meet the gorillas. Masks are worn to prevent gorillas from catching human diseases. The length of this hike depends on the location of the gorillas. Some days they can be a 10-15 minute walk from the road, other days it can take over an hour of walking to reach the gorillas. When you enter the territory of the gorillas you will be greeted by the enormous male silverback, making sure you are not a threat. After he accepts your presence a magical one hour of observing the gorillas will begin, which is truly a once in a lifetime experience. Mount Kahuzi Hike; This is the highest peak in the park, at 3,308m. The climb takes approximately 4 hours through bamboo forest and sub alpine vegetation, and 3 hours to descend. 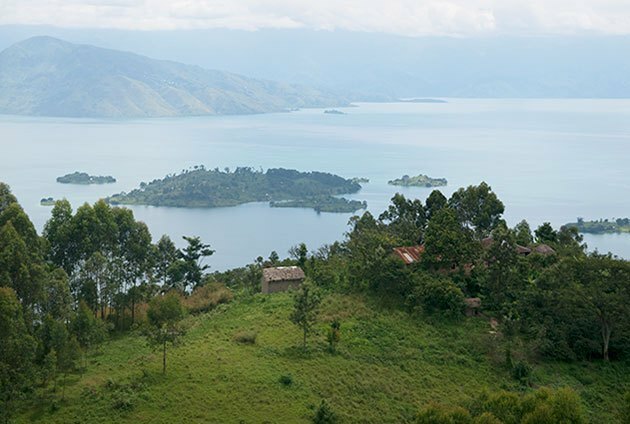 The summit provides spectacular views of Lake Kivu and the city of Bukavu. Mount Bugulumiza Trail; This 6km trail starts near the Tshivanga Visitor Centre and covers terrain regularly occupied by the Chimanuka gorilla family. The summit offers amazing views of Mt Kahuzi and Mt Biega along with the nearby landscape. The hike takes about 3 hours return. Mount Biega Hike; The second highest peak in the park lies at an altitude of 2790m. 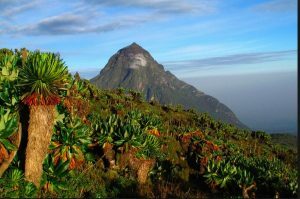 The vegetation differs significantly from Mount Kahuzi making it a wonderful ecological experience. The climb takes about 6 hours return, so it is important to make an early start. Park staff is currently working to construct a clear trail to Mt Biega, keep checking the website for updates. KBNP is located 40 km west of Bukavu town. It takes approximately 1-2 hours to drive from Bukavu to the entrance of the park depending on traffic. Follow the road heading towards Kavumu Airport and turn left at the intersection in the town of Miti. Keep driving straight until you reach the Tschivanga visitor Centre. The easiest way to get around is by using one of the several tour operators currently offering the Kahuzi-Biega National Park. However, should you wish to organize transport yourself, a couple of options exist. By Road; You can reach Bukavu by bus or by car from Rwanda via the Cyangungu border, from Burundi via the Uvira border, and from Goma via the road along Lake Kivu. By Boat; Several operators travel daily between Goma and Bukavu, with tickets for rapid boats (2 hours) costing on average USD 50 and slower but larger boats (6 hours) are costing between USD 8-25. Tickets can be bought at the ports in Goma and Bukavu and it is recommended that you get these at least one day in advance. Kahuzi-Biega National Park lying along the Albertine Rift and the Congo Basin, the park is an outstanding habitat for the protection of the rainforest and the eastern lowland gorillas, Gorilla berengei graueri. 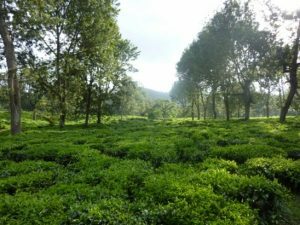 Strenching over 600,000 ha, are dense lowland rainforests as well as Afro-montane forests, with bamboo forests and some small areas of sub-alpine prairies and heather on Mounts Kahuzi (3,308 m) and Biega (2,790 m). The Park is one of the fascinating sites of sub-Saharan Africa where the flora and fauna transition from low to highlands is observable. 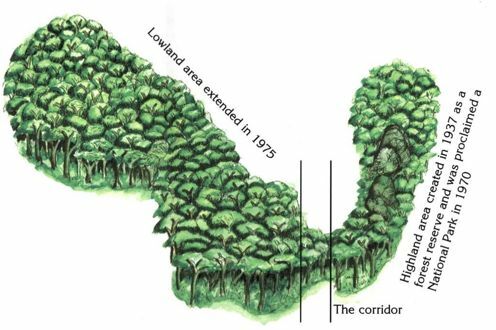 In effect, it includes all the stages of forest vegetation from 600 m to more than 2,600 m, dense low and middle altitude rainforests to sub-mountain to mountain and bamboo forests. Above 2,600 m at the summit of Mounts Kahuzi and Biega, sub-alpine vegetation has developed, with heather, and home to the endemic plant Senecio kahuzicus. The Park also contains plant formations, rare worldwide, such as the swamp and bog altitudes and the marshland and riparian forests on hydromorphic ground at all altitudes. The Park has unique a flora and fauna of exceptional diversity, making it one of the most important parks in the Albertine Rift Valley region, it is also taken to be one of the ecologically richest regions of Africa and worldwide. 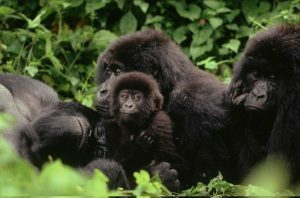 The icon species of the park include the world endangered population of eastern lowland gorillas that thrive in the mosaic of habitats distributed in the park. Kahuzi-Biega National Park boasts of wide-range of mammal species than any other protected area within the Albertine Rift Valley Region. 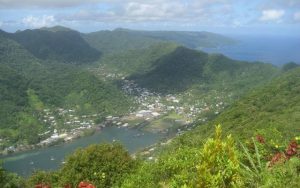 It is also the second most significant protected area of the region for both endemic species and in terms of specific diversity. 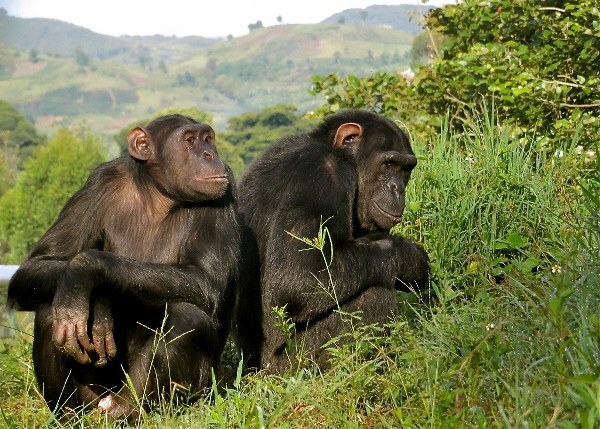 The Park houses an estimated 136 species of mammals, among which include the endangered eastern lowland gorilla and thirteen (13) other primates, including threatened species such as the chimpanzee, the colubus bai and cercopiuthic of Hoest and Hamlyn. Other extremely rare species of the eastern forests of the DRC are also found, such as the giant forest genet and the aquatic genet. Characteristic mammals of the central African forests also live in the Park, such as the bush elephant, bush buffalo, hylochere and bongo. The park is also conveniently located in an important Endemic Birding Area hence its identification as birding destination by Birdlife International. The Wildlife Conservation Society established/created a comprehensive list of birds in the Park in 2003 with 349 species, including 42 endemic. Also, the Park was designated as a Centre of diversity for plants by IUCN and WWF in 1994, with at least 1,178 inventoried species in the highland zone, although the lowland yet remains to be recorded. How to get to the park.